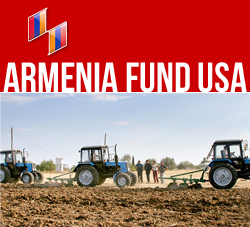 Project sponsors: Armenia Fund US Western Region, Feed the Children and the Pacon Corporation (US). Yerevan, October 16, 2015 — Between October 14 and 16, 2015, donations of art supplies, comprising 37 types of specialty items, were presented to all 12 of Yerevan’s art schools, including the National Center of Aesthetics; the Kushnaryan, Kanachyan, Gabrielyan, Terteryan, Budaghyan, Danielyan, Maluntsyan, Barkhudaryan, Saryan, and Avetisyan art scools; and the Malatia Art School. The 12 schools have a total student population of close to 7,000. Pleasantly surprised by the large quantity of the donated supplies, principals and representatives of the schools conveyed their gratitude to the project sponsors by presenting them with various artistic works created by their students. Project coordinator — Mariam Zendjirdjian.